Cooperative inquiry is based on the work of John Heron and Peter Reason . Using this method it is assumed that each member of the group has a unique contribution to offer, and it is essential that for the outcome to be complete, all members of the group are involved. The process begins by clarifying the purpose of the programme. A small but comprehensive ‘initiating group’ identifies the aims, objectives and underlying values of the project, and monitors the process throughout the life of the project. Participants are invited from the local community and networks attached to the host organisation. Care is taken to invite people from across boundaries within society and even within organisations: thus managers and employees are encouraged to attend together, along with teachers and their students, and with care staff and their clients. BCA has used this method throughout its work in the community, especially working with people in residential homes for the elderly and with participating schools and business. 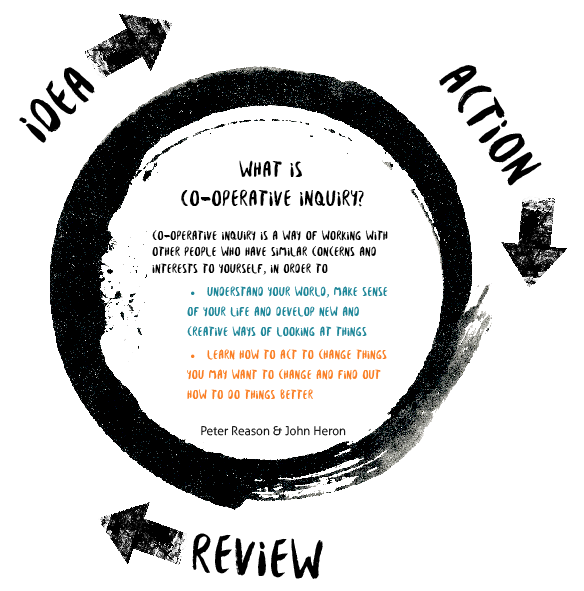 The cooperative enquiry process involves three stages: formulating an Idea together, putting it into Action, and then Reviewing the outcome. Since this involves consciously working through the three separate stages, it is often a new practice, and it may be necessary to drip-feed it into the workshop continuously, identifying each stage in the component parts of a whole workshop as the cycle of ‘idea /action / review’ repeatedly unfolds, and working cooperatively develops. In a typical BCA workshop following the formulation of the ‘idea’ directing the workshop, ‘action’ is initiated by an experimental phase of playing together with an identified art medium – black ink, colour, words, improvisation, modelling have all been used, and ‘working from your pocket’ – ten minute exchanges triggered by everyday or nostalgic objects. At times 10 –15 minutes may be set aside in silence for participants to reflect within themselves, but always coming together again to share their experiences, and comment on each other’s ideas. Finally, as part of the regular cooperative enquiry workshop process participants are invited to review their experience. Early in the process participants have identified their aims and objectives, at the end they are encouraged to be specific in looking back on their successes, mistakes, unexpected outcomes and learning as they worked to achieve their aims and objectives. Within any given workshop there may also be smaller cycles of idea, action and review as participants are invited to undertake experimental work together and reflect on it. By celebrating what we achieve together, we have become very aware of the benefits of display, publication of results and dissemination for participants who may never have had much, if any, recognition of their work and who thus feel validated both as creators and as initiators of change. It also brings the possibility of change to the attention of a much wider community and encourages others to join in or start their own cycles of idea, action and review. A particular enquiry, using arts media with people in dementia, is reported in Chapter 7 of Care-Giving in Dementia: research and applications, volume 4, edited by Bere M.L. Miesen and Gemma Jones. (2006) Published by Routledge.